# A travel company is doing a trip to Pitcairn Island in Feb 2018 for $11,000-ish AUD. It includes 11 nights on Pitcairn. It looks like you have to make your own way to Tahiti but from there all other expenses are covered - flights to Mangareva, Claymore II to Pitcairn, Accommodation and the return. There is room for 6-8 people on the tour. A brochure with an itinerary and FAQ are available. # Barbara Kuchau, the owner of the Friends of Pitcairn group, passed away a few months ago. This left the group in limbo as there were no other moderators or owners. No new people could join and no changes could be made to the list. As a result the group has moved to a new place, New Friends of Pitcairn. Membership works the same way as the old group. 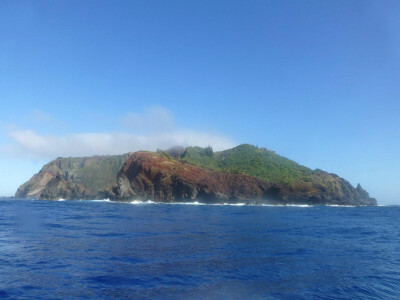 # In April 2012 I took a trip to Pitcairn Island. I wrote a few things about it but I don't think I posted a gallery of some of the photos I took on the trip. 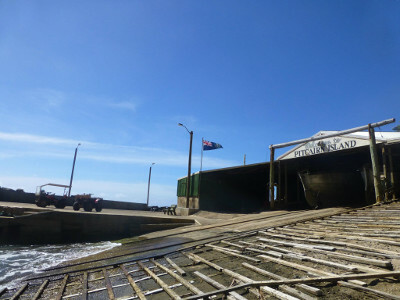 I've put these online in a Pitcairn Island Trip 2012 gallery. The photos cover the trip from Mangareva, the closest airport to Pitcairn, the yacht trip from there to Pitcairn, staying on the island and back again. I took a lot more photos but these are a selection of them. Hopefully I get a chance to visit again. The Pew Charitable Trusts and the National Geographic Society praised action by the British government today to create the world's largest fully protected marine reserve around the Pitcairn Islands, an overseas territory in the South Pacific Ocean. This is the official goverment Pitcairn products site. From here you can purchase coins, books, honey and honey related products, playing cards, phone cards and Pitcairn flags. The honey purchases from this site go to PIPCO, a community cooperative, so the islanders benefit from the income. 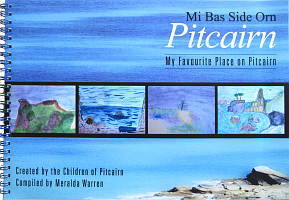 I especially like the children's book, Mi Bas side orn Pitcairn. It has snippets in the Pitkern language that are a joy to read. The place to purchase Pitcairn Island stamps. They have facebook page too. Note that it's a 'person' page so you have to send a friend request. This is the website of Islanders Meralda and Mavis Warren. There's a bunch of stuff available in their store and can be bought using PayPal. There's honey, body cream, necklaces, earings, baskets, Pitcairn songs, and more. Coffee coming soon too! Be sure to check out Tapa pages, like this tapa 2014 page. Kimiora Warren Peu, one of the younger islands, has their own tapa page too which look to be available for sale. Mike Warren's website, Online Pitcairn, has a souvenirs page with items that can be purchased via PayPal. The page lists Bounty models, walking sticks, and other carvings. There is also a basket, honey and Pitcairn Island map. This is the website of Tom and Betty. Unfortunately Tom passed away last year and I'm unsure if Betty is still taking orders. The page lists Polo shirts, books and hats, various assorted items and photographs. I purchased a bunch of goodies from Betty when I was on Pitcairn in 2012 and treasure them still. The website of Brian and Kari Young. Their shop page shows examples of the many carvings that can be done. It also lists the history of carving on the island. There's a great history on Pitcairn Honey there as well. The website of Kerry Young and Heather Menzies. Their product intro page describes some of the items available, which include soap, baskets and dolls made by Nola Warren, and handcrafted jewellery. Make sure you look for the 'Next' link on some of the pages for further products. The website of Jay and Carol Warren. Their souvenirs page has the list of products available. This includes shirts, singlets, tea towels, baskets, hattie leaves, grass skirts and dried fruit. The website of Mike and Brenda Christian. The online store lists honey products, printed products, and wood carvings. The website of Dennis and Irma. The products page has honey, walking canes, carvings, baskets, books, maps and other things. This is the website of Dave Brown and family. The products include, honey, carvings and canes. The Bounty model available here can be carved by Len Brown or Dennis Christian. Nadine is the islands resident author. Her books have Pitcairn as the location and theme. Her books are available on Amazon as physical books or Kindle e-books. You can find the list on her books page. Keep in mind that ordering from Pitcairn can take some time. The supply ship is on a three month rotation and this is how orders get sent out. This is part of the attraction of ordering from such a remote place. The anticipation of the wait, the rarity of the items you get, and the wonderful quality of them. Many thanks to the link of islander sites listed at the Pitcairn Islands Tourism site and Friends of Pitcairn mailing list which helped in building this list. If there are any other sites that provide online ordering of Pitcairn items where the funds go to the island please get in touch via chris@pitcairnnews.co.nz. Most of these put the blame on the isolation of the island, lack of jobs and the trials that occurred 10 years ago. Wikipedia even has a section on the potential extinction, although that has opinion presented as fact. For example, it cites the diaspora survey showing only three people in the responses expressing a desire to return and then states "This may be partially attributable to the 2004 sexual assault trials which has caused many emigrants to be ashamed...". The "...may be..." with no cite shows it's the thoughts of the wikipedia editor who added it, not the actual results of the survey itself. I was one of the 33 responders in the diaspora survey. In my case it was not any "ashamed of their heritage" that was the issue. One of the points I noted in my survey response was that there is a protection order on the island that makes it difficult for families to bring children. Anyone who has tried to get a visa to the island to take children can attest to the difficulty of that process. I made a point on the survey that to encourage people to return they need to have a timeline in place for when the protection order will be lifted or some other process by which people moving to the island can understand that there is a future in which it will be lifted. People like to travel with their families. I'd also like to note that the survey was not just for residents who had left the island but was also for their descendants. I believe that the low response rate for the survey was due to mistrust amongst many with how the survey would be used and the information that it contained. Also exacerbating any hope that immigration will replenish the island population is xenophobia among the residents. From my trip there in 2012 I found the islanders very warm and welcome. There was no "xenophobia" that the wikipedia article states is an impeding factor for immigration. There is no evidence or cite given for this statement and it seems intended to discourage people from having a positive view of Pitcairn. This section of the wikipedia page was originally written by wikipedia user JBarta. Most of the recent edits in this section seem to be made by an IP address associated with a UK immigration lawyer. Please don't use the negative press as your main source of information about Pitcairn. Consider visiting the island as a tourist and spending some time there. Reach out to islanders via email or contact from their websites. For information on immigrating to Pitcairn Island there is a FAQ on the Pitcairn Immigration site. More information is available in the Repopulation Plan (PDF). # The area encompassing the Pitcairn Islands has four individual islands. The most well known is Pitcairn Island itself but there is also Henderson, Ducie and Oneo island. These are spread over hundreds of miles of ocean and has one of the best preserved eco-systems on Earth. The Pitcairn Islanders and the PEW Charitable Trust is lobbying for that area to be made a marine reserve. This would prevent commercial fishing in the area and damage to the ecosystem. A coalition of over 100 conservation groups, prominent academics and film and TV celebrities have called on the Foreign Office to declare full protection zones around the Pitcairn Islands in the Pacific ocean, as well as Ascension Island and the South Sandwich Islands in the Atlantic. The three proposed reserves would together protect around 1.8m sq km (0.7m sq miles) of ocean and more than double the size of the world's existing marine protected areas (MPA). PEW has a great brochure about the Pitcairn marine environment and you can follow the progress of this on the Protect Pitcairn: An Underwater Bounty facebook page. Pitcairn Islanders Speak Out about Marine Reserves and Pitcairn's Pristine Environment are a couple of videos on facebook that are useful viewing. Please help to encourage publicity on this topic and work towards the UK government making a positive decision on the marine reserve.